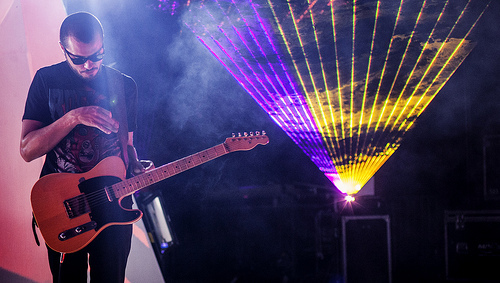 How do you incorporate light into how you design your shows for Ghostland? What’s the process like? When you think of past shows you’ve done for particular albums, is there one that stuck with you, one that you’re particularly proud of in terms of how it came together and why? When you have a tour like that, how much are you able to calibrate the display? Is it one of those things where from the outset you have to nail it by means of having the correct equipment to create that mood and feel, or is it one of those things where you’ll do a couple of stops – maybe you’re looking for a little different ambiance and you can have that sort of course correction? So it is preset? It’s not something where you’re DJing the lights with respect to the songs? So it kind of becomes a conversation. That’s really cool. When you’re making that dialogue between the sound and the light, how do feel the audience plays into that? Do you feel it’s sort of two-way or does it have that certain interactive component? You mentioned that you worked with a team out of Pittsburgh and you also mentioned you having light techs that are a part of your crew when you’re doing these shows. Are there people that you work with consistently and why? Now with the lights you’re actually using, are there certain types of lights or brands that you enjoy – that help you create particular moods or feelings? There seems to be kind of negative-space quality about your sound and the lighting seems to replicate that as well. It sounds like a huge space and feels like a huge space with that black and white contrast. In terms of the feelings that it evokes, what is conveyed with that start contrast and balance?